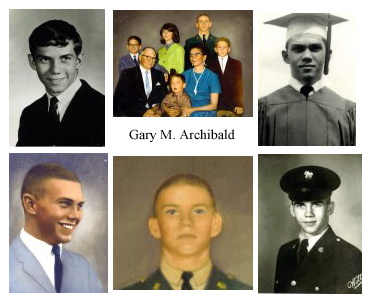 To locate profiles of others on The Wall who share commonalities with GARY MICHAEL ARCHIBALD, click on the links above. Gary was a member of the 101st Airborne. During the Tet offensive of late January 1968 the 82nd Airborne suffered a 25% casualty rate. Late Feb. early March of 1968 one fifth of the 101st were sent to support the 82nd. That is where Gary met his fate. The last picture to be taken of Gary was with his family in Indiana. The picture was taken in black and white, color cameras were rare at that time. The photo was later colorized by being painted over. The other photos are from boot-camp, his high school graduation and two others of his school years.